Relatively new, fast-growth companies often show their immaturity in the way they try to control communications. 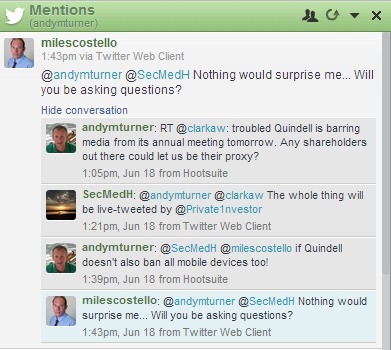 AIM-listed Quindell is a case in point. It’s gone from zero to £380m revenue in five years. Tomorrow is its Annual General Meeting but journalists aren’t welcome: they’ve placed a ban on media attending. It seems the company believes that by locking out reporters from The Times and elsewhere it will somehow receive better media coverage. I can only speculate why because the firm’s website says nothing on the subject. There are no financial PR or media relations contacts, agency or in-house. Its Twitter feed hasn’t been updated since 2 May and is similarly silent on the matter. Remember, this is a public company, so City reporters are obliged to follow and report what it does. What do reporters do when you try to lock them out? They find ways to subvert the ban, using social networks, as you can see from this Twitter conversation. And when they finally file their stories – how sympathetic will they be to the company that tried to ban them? Most companies need to build bridges and work with the media during both good and bad times; they need to create some relationship credit and goodwill, to accept that sometimes sentiment will be negative. Management at Quindell doesn’t appear to understand this.